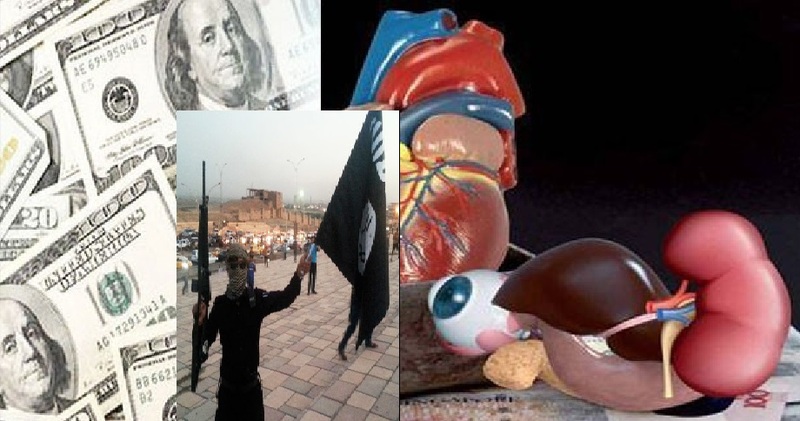 JNN 23 Dec 2014 The terrorist organization of the Islamic State of Iraq and Syria (ISIS) has turned its hand to human organ trafficking to fund its terror activities across the Middle East, Daily Mail newspaper said. The terrorist organization of the Islamic State of Iraq and Syria (ISIS) has turned its hand to human organ trafficking to fund its terror activities across the Middle East, Daily Mail newspaper said. However, it seems there are other sources to fund the terrorist group, including trafficking human organs, the US-based media website Al-Monitor reported earlier this month. The website quoted an otolaryngologist, Siruwan al-Mosuli, as saying that he lately noticed unusual movement within medical facilities in Mosul. “Information then leaked about organ selling. Surgeries take place within a hospital and organs are quickly transported through networks specialized in trafficking human organs,” Al-Monitor cited Mosuli as saying. He said that the organs come from fallen fighters who were quickly transported to the hospital, injured people who were abandoned or individuals who were kidnapped. Organ sales yield large profits, Mosuli added, noting that a specialized mafia is engaged in these operations, in addition to medical institutions working in other countries. In further evidence of the Turkish and Saudi regimes’ involvement in the crimes committed by ISIS through the unlimited support they have offered the organization in terms of money, armament, training and movement, the article noted that most of the organs harvested are being smuggled out of Syria and Iraq into neighboring countries like Saudi Arabia or Turkey “where criminal gangs sell them on to shady buyers across the globe,” citing the Assyrian International News Agency. The Daily Mail also referred to drug smuggling is one of ISIS most lucrative revenue streams another, citing Al Monitor’s report as saying that ISIS traffics Afghan heroin into Europe from the city of Nineveh, with this drug business becoming so successful in recent months that reports claim that ISIS now supplies half of Europe’s entire heroin market. The ISIL terrorists control some parts of Syria and Iraq. They are engaged in crimes against humanity in the areas under their control. ISIL terrorists have terrorized and killed people of all communities, including Shias, Sunnis, Kurds and Christians. The US-based media website also reported other sources of funding, including imposing taxes on residents, drug trafficking, selling humans and human smuggling rings. This entry was posted in Iraq News, Middle East and tagged Drugs trafficking, Human Organs Trafficking, Iraq, ISIL, Islamic State of Iraq, Saudi Arabia, Syria, Turkey. Bookmark the permalink.